The Cuban Vireo is endemic to Cuba and where it is sedentary. It frequents forested areas and bushy thickets at low elevation. Four subspecies share the Cuban range, with two races on Cuba Island and two others on small nearby islands. The Cuban Vireo is common throughout the range, and currently, this species is not globally threatened. 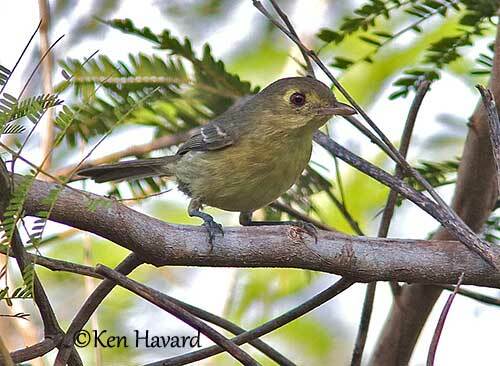 The Cuban Vireo of nominate race has dull olive-grey crown, ear-coverts and back. It has a pale yellow to creamy-white eye patch extending from lores to behind the eye. The cheeks are pale yellowish-grey. On the upperwing, primaries and secondaries are pale brownish-grey. Median and greater coverts are similar but with pale tips forming two narrow wingbars. The tail is dull brownish-grey. On the underparts, throat and breast are pale yellowish. The belly is paler, but the sides are greyer. The undertail-coverts are dull yellow-grey. The bill is grey-brown on the upper mandible and paler below. We can see a small hook at tip. The eyes are dark brown to dark reddish-brown. Legs and feet are bluish-grey. Male and female are similar, but some individuals can be yellower. The juvenile resembles adult but it is duller. The Cuban Vireo has four subspecies. V.g. gundlachii is on Cuba except SE, and I of Pines. V.g. sanfelipensis is found on Cayo Real, W of I of Pines. This race has paler underparts, especially on chin and throat that are mostly whitish. V.g. magnus occurs on Cayo Cantiles, E of I of Pines. This one is larger with longer wings and tail. The upperparts are less olivaceous, and it has paler yellow underparts. V.g. orientalis is found in SE Cuba, E of Camagüey. This race is greyer than others, but it has paler underparts. The Cuban Vireo frequents forest edges, thickets, dense scrub and bushes at low elevation, but sometimes, it can be seen higher in hills and mountains. It is often found in coastal regions. It is able to live in degraded forests, finding suitable feeding and nesting habitats in areas with scrubs and shrubs. The Cuban Vireo gives a high, repeated call “wi-chíví, wi-chíví…”. The alarm call is a guttural “Shruo”, typical of numerous vireo species. During the courtship displays, it gives a rapid, repeated “wheet”. The Cuban Vireo feeds mainly on insects, fruits and small lizards. It usually forages in pairs throughout the territory and often joins mixed flocks with Yellow-headed Warbler and Oriente Warbler. It forages in the lower parts of the vegetation. It swallows the smaller prey whole, but larger items (crickets) are hold with a foot, while the bird uses its hooked bill to rip bits off. It forages among the foliage by making short flights or leaps from twigs to leaf clusters. During the breeding season, the Cuban Vireo is strongly territorial and often attacks intruders, even conspecifics. It flies at them and makes bodily contact. Both male and female use some visual displays such as raising the crest feathers, or spreading and lowering the tail. They also perform gaping with open bill, in order to expose the colours of the mouth. The Cuban Vireo is sedentary. It has broad, rounded wings and only performs short flights. The breeding season usually takes place between March and August, with peak in April/June. 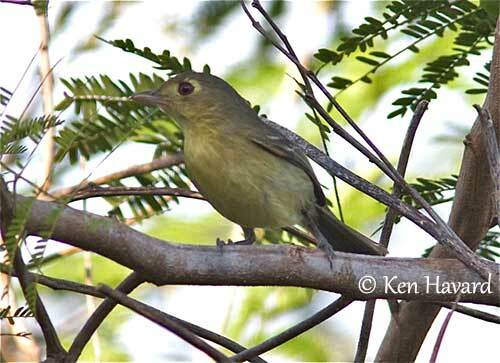 The Cuban Vireo builds the nest well hidden among the thick vegetation, tangles or vines. It is a cup-shaped nest made with grasses, mosses, lichens and plant fibres, held together with spider web. This small structure is packed very tightly with plant material. It is placed between lateral forks of twigs and supported by the rims. Both mates build the nest. The female lays 3 white eggs with small dark spots. She incubates during 13-15 days, but the male may help sometimes. The chicks are fed by both parents. They leave the nest at 10-14 days old, and remain for some time with the adults, about two weeks. 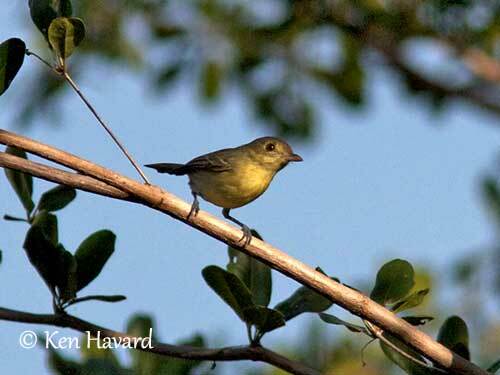 The Cuban Vireo has restricted range in Cuba and nearby islands. It is usually common throughout the range in suitable habitats. However, the subspecies “magnus” and “sanfelipensis” are vulnerable to violent climate events such as hurricanes, because they have very small ranges. The population has not been quantified, but it is suspected to be decreasing, due to deforestation and illegal hunting. 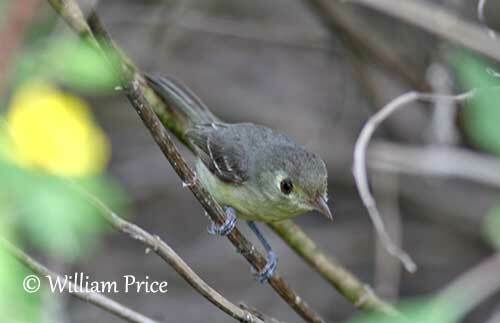 But in spite of these threats, the Cuban Vireo is currently evaluated as Least Concern.